Macy has been a part of our life for about four and a half years now. She has been a great addition to our family and has changed my attitude towards pit bull type dogs. My wife, Robyn, found Macy on Petfinder.com. She had been dumped outside a shelter near Trenton, N.J., in very bad shape. 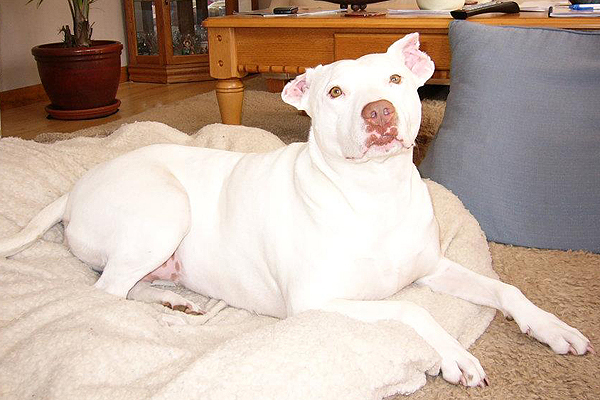 She had scars on her face and legs, and weighed only 30 pounds (she is now healthy at 65 pounds). Her body was infested with just about every possible internal parasite, and parts of her ears were missing – they had either been cut or chewed off. Despite this condition, her profile said that she was a sweet girl with a mellow personality. 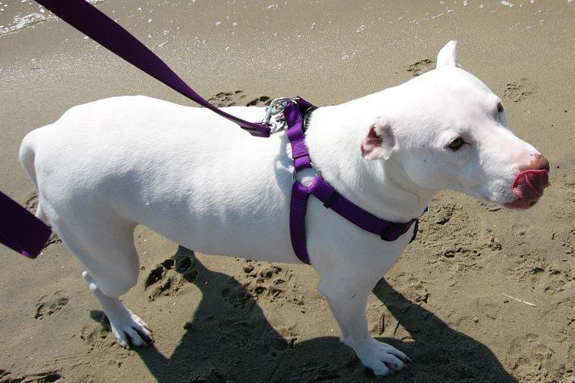 She had a gentle disposition and was great with people, children and other dogs. Luckily a local group, Pet Rescue of Mercer, paid to have Macy nursed back to health and was working to adopt her out to a loving family. One Saturday afternoon we decided to go meet Macy. Just like her profile said, she was mellow and friendly. The people from Pet Rescue of Mercer were extremely helpful and knowledgeable too. I have to admit, despite all of this I was extremely nervous because Macy was a pit bull mix. It took about two weeks for Robyn to talk me into adopting her. As it turned out, that decision was one of the best ones that I have made. Macy is one of the best dogs that either of us has ever had. She loves to run and play in her fenced in backyard, especially with her friend Jenna – another pit bull mix who lives next door to us. Some of her other favorite pastimes include relaxing and sleeping in the sun during the daytime and cuddling up close to us on winter evenings. I never thought there would come a time when I would not be allowed to sit on my own furniture … but that time has come. Macy usually stares me down until I get on the floor with her. She then cuddles up close as I cover both of us with a blanket. This goes on during the entire winter season. She has touched the hearts of our entire family and just about everyone else who meets her. In fact, in 2010 we were attending a pet expo, and people told us we should try to do something with her to help promote pit bull type dogs. Later that week I woke up early in the morning with a story in my head. Instead of going back to sleep, I decided to get a pen and paper and begin writing it down. It took a few months, but the story eventually turned into a children’s book about how my wife and I came to adopt Macy. Since kids are more impressionable, I thought why not start there? However, I had never published a book before and knew nothing about how to go about it. My friend suggested a self-publishing website called Lulu.com. They helped me put it together and also provided me with illustrating services. 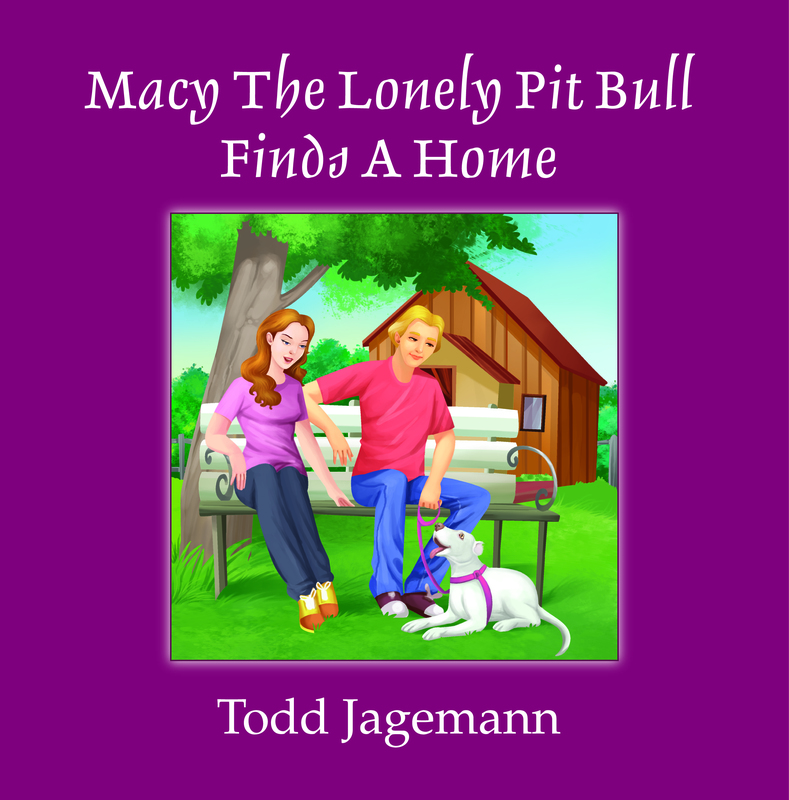 “Macy The Lonely Pit Bull Finds A Home” is now available on Lulu.com. A portion of the proceeds are donated back to Pet Rescue of Mercer, the organization that helped save Macy. My wife and I also try to attend different pet events to help promote the book, the breed and raise some money for animal charities. We have met so many great people and have become more educated ourselves by doing this. Macy now has her own Facebook page and has had several articles written about her in different newspapers. She has been featured in the Home News Tribune, Asbury Park Press and The Times of Trenton to name a few (all can be found via Google search). It is kind of funny how a four-legged friend can completely change your life. Macy is beautiful & you are more beautiful for taking Macy in! What a sweet story. My dog stares me down to come to cuddle too…she “rumbles” if I take too long. Thank you for sharing. @ValerieSherman Thanks Valerie! Make sure you cuddle with Lacy!!! yep,my pibble does the same thing!soo funny,middle of the night i hear this “moooom” and it’s outlaw havin to go out!first time I heard it scared me!in a good way,though! !haha i wouldn’t have any other breed,Outlaw has helped me thru surgery,depression,and a whole host of panic attacks.He,by the way,is the first pit bull in our county to not automatically be put down after 72 hours! City council had to vote on whether to allow him to be adopted.So he’s actually historical! @LisaBrooks Outlaw sounds like an incredible dog. We would love to share your story here. if you are interested send your story about Outlaw and photos to [email protected]. Thanks so much, kisses to Outlaw! @StubbyDog ok,i’ll work on gettin the pics and story together. What a beautiful story – so happy for Macy and her family! It’s awesome that Todd wrote a children’s book about Macy. 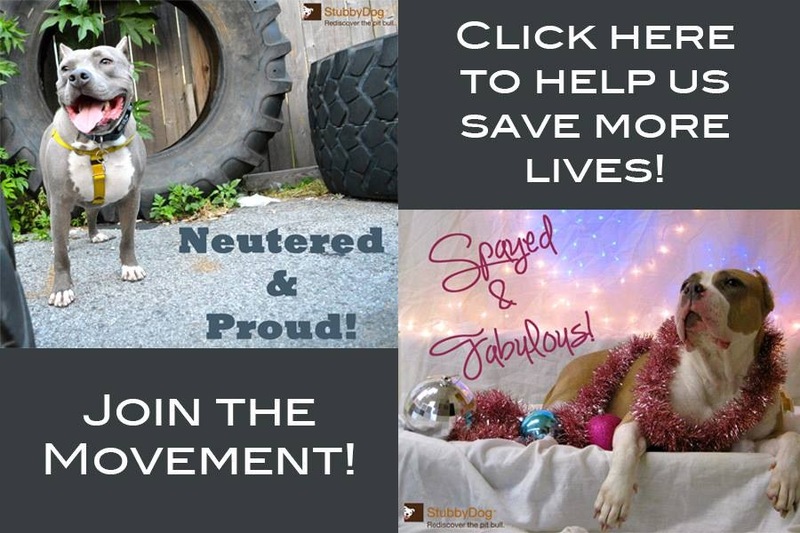 Reaching out to youngsters will ensure a better future for pit bulls and all homeless pets. Way to go, Todd! 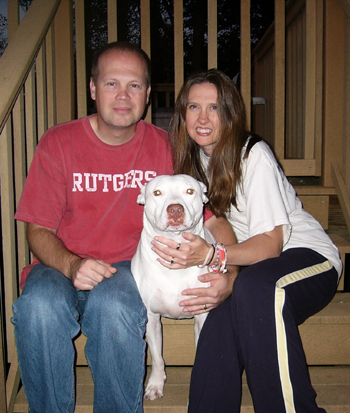 Thank you for bringing Macy into your hearts and your home, and for sharing your beautiful story with us. Chills and goosebumps. Tears and smiles. Darling Macy, you ARE an “angel with paws.” All pits are. IMO. And to all involved in making certain you are allowed to sprinkle your “magic” on souls everywhere, “dog” bless you. I love it, pit bulls are a great choice for children’s books! What’s better than a adorable, friendly & child loving dog like a pit bull?! @dragondix2 we couldn’t agree more!